Best Galaxy Note 9 Deals: We’ve rounded up all the best UK contract deals for this excellent big screen phone. Samsung helped to pioneer big screen ‘phablets’ with its Note series of phones. It wasn’t that long ago that people considered the original Note to be too big, but nowadays big screen smartphones have become the norm. The latest, the Note 9, has really refined the concept and unsurprisingly got an exceptional review when we put it through its paces. If you’re in the market to pick one up, you’ve come to the right place as we’re constantly keeping an eye out on the best contract deals. We’ll be keeping this page updated constantly with the latest deals as they become available. 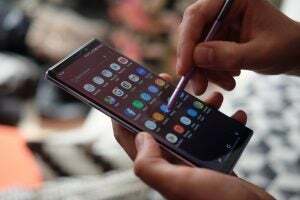 Right now, these are our pick of the bunch when it comes to Note 9 contracts that will meet most people’s needs when it comes to data and total cost of ownership. If you need a lot of data, this is a great value contract on O2. Use our code to take £10 off the upfront cost as well. If you don’t mind paying a bit more upfront (use our code for a discount), and don’t need as much data, you can take your monthly cost and TCO down considerably with this offer. 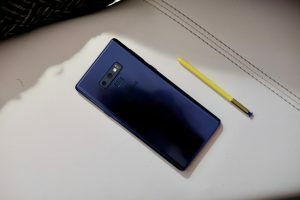 If you find the above contracts don’t tickle your fancy, then you can use our handy comparison tool to find the perfect Note 9 deal for you. You can easily filter based on what you’re willing to pay upfront and each month, and how much data you need. 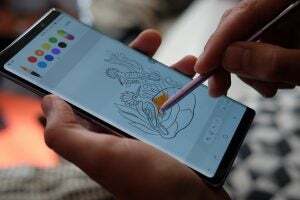 On the surface, the design is more an evolution of the Note 8, rather than revolution, much like the move from the Galaxy S8 to the Galaxy S9. That said, the Note 8 was already a good-looking phone so only small improvements were needed to keep the design feeling fresh. Nowadays, data allowance is the big difference between contract offers. Call minutes and text allowances have become largely inconsequential, so much so you’ll find tariffs more often than not just giving you an unlimited amount of each. The most important factor (beyond price) is the amount of data you’re allowed each month. Everything from browsing the web, streaming music or video, or using messaging services like WhatsApp and Facebook Messenger all use your data allowance. If you run out of data that can mean seriously limiting how you can use your phone each month, that is unless you’re willing to pay for some extra data for the month. Often in this case you end up paying through the nose. For this reason, you’ll want to get your data requirements right when you first sign up for a new contract. If you’re only a light user, such as light browsing and using messaging apps, but not necessarily streaming a lot of video, a data allowance between 4GB to 10GB should likely suffice. If you find yourself streaming a lot of video, such as on Netflix, or want to tether your laptop to your phone to share the data connection, you’ll likely want to have at least 15GB of data each month, if not more. It really doesn’t hurt to have more just in case. We consistently see high data contracts costing the same as low data options, or only slightly more. So it’s worth having a look to see if you can get more data or your money. You never know if your circumstances might change, such as discovering you just have to binge a new Netflix show on your daily commute. Better safe than sorry. Upfront cost or no upfront cost? So your phone contract is typically broken down by your phone’s upfront cost – which is the amount you’re contributing towards the cost of the phone at the outset – and the monthly cost. As a contract is usually 24 months, you can consider the total cost of ownership (TCO) as upfront cost + (monthly cost x 24). The networks have essentially factored in the remaining cost of the phone into your monthly charge, so you gradually pay off the phone. Typically, you’ll find your TCO is lower if you’re able to pay a higher upfront cost at the beginning. This also usually reduces your monthly outlay for your phone contract. But paying a chunk of cash at the beginning isn’t for everyone, so some contracts have very low or zero upfront costs, which then lets you spread the cost of the phone over 24 months. Even if this means you’re paying slightly more after 24 months this might be a worthwhile option if it’s the only way you’ll bag the phone of your dreams. Before you potentially pick a new phone network provider, you’ll want to make sure you have good network coverage wherever you need it. This is for both phone calls and 4G data. You should start by checking your home and work addresses. Poor coverage can particularly be a problem in more rural areas. Beyond just checking the all-important coverage for your prospective network, you should also look into any perks and benefits afforded to you on a contract. Each network has its own added incentives. O2’s big incentive is O2 Refresh. This essentially splits your bill into two payments: paying off the cost of the phone, and then the service plan. Once you’ve paid off the cost of the phone, your monthly bill will reduce accordingly. It means not overpaying, which is something many people find themselves doing after their contract is up. You also have the option of trading in your phone to upgrade at any time, so you can have the shiniest new smartphone whenever you want and not have to wait the 24 month contract out. O2 also has other benefits through such as priority tickets to events for O2 customers. Vodafone has different tariffs types, so be sure to check what kind you’re signing up for. The most enticing is often Red Entertainment. This includes free subscriptions to services like NOW TV, Spotify Premium, Sky Sports Mobile TV and Amazon Prime Video. These would otherwise cost extra, so provided you actually want one, it’s an additional saving. Vodafone has also bumped up its roaming options, so you can now use your plan in more countries abroad on certain packages. EE gives you six months of Apple Music and three months of BT Sports mobile with its contracts. You also get the widest 4G coverage in the UK (at least according to its figures). Three has Go Binge, which means select streaming services like Netflix and Apple Music don’t count towards your monthly data usage. 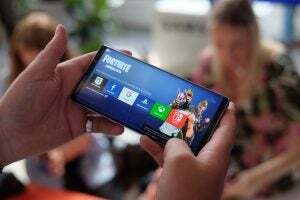 That could potentially mean you can sign up for a lower data tariff and not worry about going over if your main use is going to be Netflix streaming. While you might take out a new contract, you don’t have to give up the old phone number you’ve had memorised for the past few years. Simply ask your old network provider for something called a PAC code, which you can then provide to your new provider. This stands for Port Authorisation Code and essentially gives permission for your phone number to be transferred over. It usually takes about a day for this to happen but it won’t cost you anything. 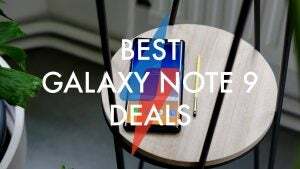 The post Best Samsung Galaxy Note 9 Deals in the UK for February 2019 appeared first on Trusted Reviews.